She is not like you. She is softer, better. And wasn’t that ironic? He was the angel, she the human, and yet he was the one in need of pardon. Zacharel is in charge of an angelic army of misfits. These guys are walking a line. They are capable of redemption, but on the flip side, they are perilously close to losing their wings. (For Lords of the Underworld fans, Zacharel is the angel who gave Haidee a piece of his brother in The Darkest Secret.) Dark, broody and mysterious at that time, those characteristics have only intensified. Centuries after the death of his brother, the guilt weighs him down. His Deity has placed him in command of these angels and he is very tired of the demonic threat. He is weary of the fight, until he walks in the Moffat County Institution for the Criminally Insane, the place where Annabelle Miller has resided since her parents murder four years ago. Demons surround the prison and, apparently, this exotic beauty is the target. Full of attitude and a bravery that Zacharel admires, Annabelle captures his attention and he realizes that he cannot leave her. Annabelle has seen demons since the night of her parents murder, killed many and is astonished when Zacharel arrives. Four years in a drug-induced haze has killed any tendency for hope in the young woman and yet this angel takes her away. Determined not to exchange one prison for another, Annabelle balks at many of Zacharel’s commands. Dumbfounded by emotion, Zacharel wonders why the human does not understand he is trying to protect her. As time progresses, Zacharel realizes he will do anything to keep her safe. The action is intense. Gena Showalter does not pull any punches. There are angels who have had their wings ripped out, humans and angels alike who have survived torture, demons who make your skin crawl. There’s nothing pretty about what happens in a fight in this world. And the choices that are put before these characters makes it impossible to put this book down. In short, Showalter nailed it. She tied into a world the paranormal romance readers already know (LOTU) and love and created two characters who we pull for. Not only that, she made a supporting cast that I am jonesing to see more of. I can’t stress this enough. Koldo stars in book two, but there are three angels who must get their own story. First and foremost, Thane. Xerxes, Thane and Bjorn are three who have a very close bond, survivors in their own right and they have stories to tell. Gena did a masterful job in dropping hints about Thane and I beg her to tell his story next. Complete with a pretty please with a cherry on top. I have to read this! I put myself on a somewhat strict book buying ban until I can get halfway through my tbr but I am really into giving in and just purchasing this one. 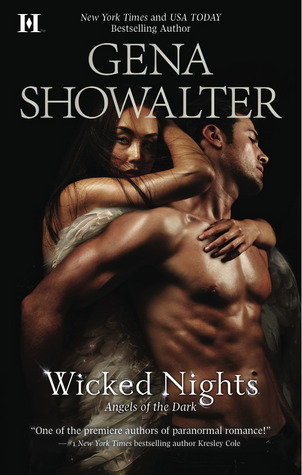 Your review makes me that much more curious about Wicked Nights. Loved it! Does Axel remind you of anyone.. *cough* William *cough*. Gotta love the trio too and of couse the LOTU cameos! Almost finished, cant wait till the end 🙂 . Aanchal, I am so glad you are getting the book. It’s just…wow. Yeah, that sums it up pretty well. Tamika, I hadn’t thought about it until you said that. Which reminds me. I think we need Willie’s book soon, don’t you? The cameos rocked. You have GOT TO love the harpies. And Paris just floored me. I think the line was something like “she can’t help it”. Ha. At least he realizes his sexiness.